Cigarettes sold in Oregon have been on a long-run decline since the early 1980s, if not longer, as the smoking rate and overall consumption and usage have plunged. Oregon’s trends have matched or exceeded the national ones over this time period. However, packs sold in 2015 were 2.7 percent higher than in 2014, or nearly 360,000 more. So it’s important to try and figure what is going on here. Overall, the tax differential between Oregon and Washington has had a large impact on the number of packs sold in each state. When Washington raises their tax and Oregon does not, Washington sales fall considerably and Oregon’s stabilize or increase. The opposite is true as well. 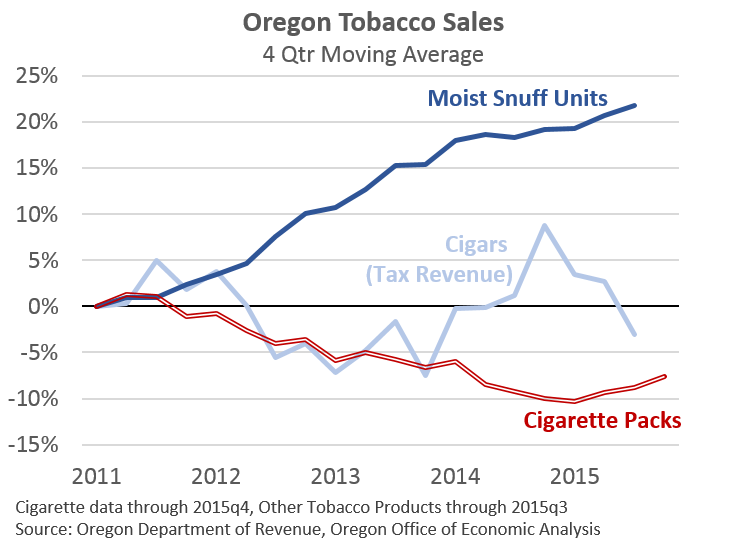 However, you have to go back to the early 1990s to find a time when Oregon cigarette sales increased and the tax environment was stable, like it is today. 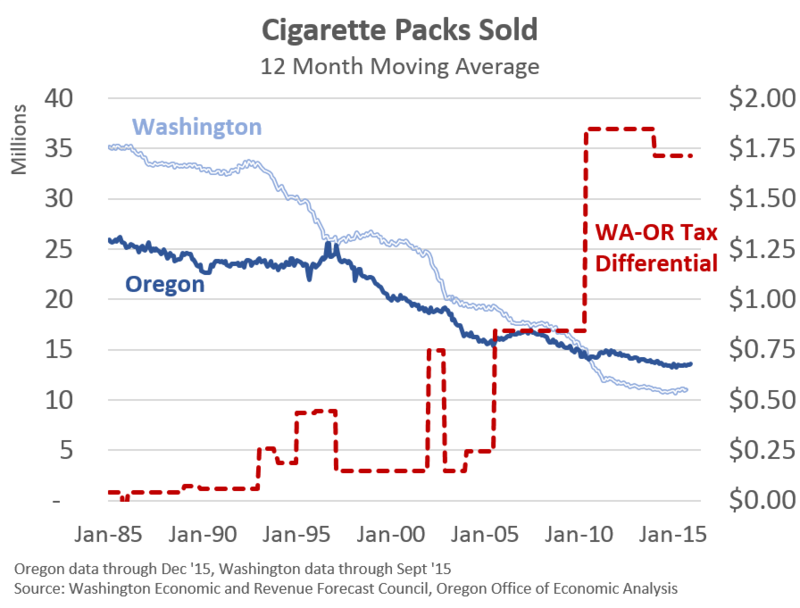 Every other instance in the past 25 years of increasing Oregon sales was directly after Washington increased their tax per pack. It can be hard to know what exactly is going on but we do know two things. Based on a recent conversation among our counterparts across the country, this increase is sales is a nationwide trend. The vast majority of states said their sales were above forecast, with many seeing small increases in sales like here in Oregon. The other states saw stabilizing sales or smaller declines then expected. So the driver of these trends is national in scope, and is not a local phenomenon. This could be the increase in disposable income due to lower gas prices finally showing up in the sales data. It could also be related to the overall improvement in the economy, with more plentiful economic opportunities, rising wages and relatively strong consumer sentiment. It could also be related to consumer behavior and changing tastes or preferences, which is item number two. A recent Wall Street Journal article looked at e-cigarette sales and usage. It pointed out research indicating consumers did not like e-cigs as much, sales have slowed, manufacturers and retailers have a backlog of inventory, and increased scrutiny from states have all impacted the industry. Along these lines, it is very plausible that some smokers switched to e-cigs in recent years, but did not like them, and have switched back to cigarettes, thus the uptick in sales following previous declines. The second chart focuses on more recent trends. The uptick in cigarette sales is more apparent here than in the long-run graph above. The moist snuff and cigar data comes from quarterly tax filings with the Department of Revenue. DOR Research has been compiling this information for us in recent years, which is quite helpful to see the various trends in the Other Tobacco Products (OTP) category. The big driver of sales and revenue in OTP is moist snuff, which continues to increase. Cigar sales can be noisy, but fairly steady over time, like loose tobacco sales as well. Overall OTP revenues so far in 2015-17 have actually come in a bit below forecast (-$1.2 million). Our outlook for OTP tax revenue is for annual increases of about 3 percent, which is a mix of moderate growth in moist snuff and flat trends in all other OTP products. Among our counterparts, there seems to be a consensus for moderate growth in moist snuff consumption (2-5% annually, depending upon who you talk to) until proven otherwise.